From the east side of Baraveha, the mountain is easily climbed using the Blackwater loop walk. 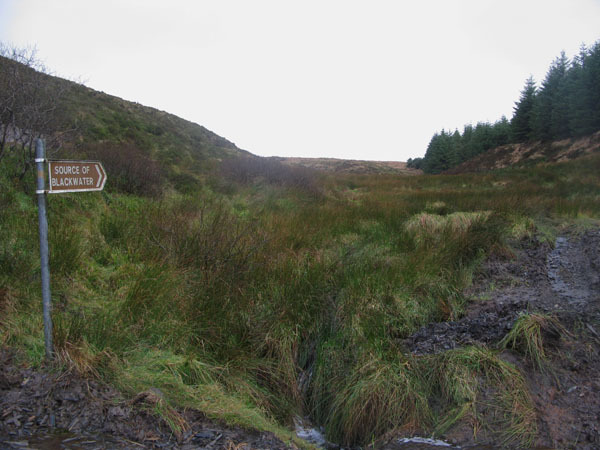 The trailhead is signposted from the R578 Ballydesmond to Newmarket road, just outside Ballydesmond. Follow the signposts to a forest entrance on the right at R1197 0677 A, where there is plenty of parking and a map board. This point can also be reached from Coardal, near Castleisland. Check out the mapboard, note the colour of the markers for the Blackwater loop and follow the markers along a gently rising forest track for a couple of kilometres up to a little boggy valley from which the mighty River Blackwater springs (R1248 0906 B). Might I remind any Cork or Waterford people who claim this river as their own, that it rises in neither county, but in Kerry (like many great things! ).